Space, time, material and attention are vital elements in Matt Sherratt's work. When Matt creates he uses a form of meditative practice to allow himself to be present and attentive to the creative process. He attends to the 'nothing' and allows 'something' to form. This connects him to deep modes of generative force. Just as the Universe holds distinct reflective forms and spaces of dark matter, the forms that emerge in the studio create worlds within worlds. Matt's forms are honed and shaped to balance aesthetic surface tension with framed spaces. The finishes on his pieces hold and reflect light. A lustre glaze will bounce light while a terra-sigillata surface absorbs light, either dramatically or sensitively, through minimal colour. From earth bound materials to framing space my work explores deep questions of existence, of why there is something and not nothing. 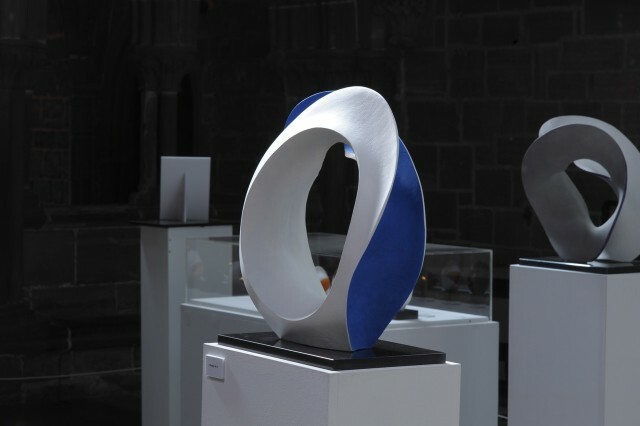 The pieces play with opposing ideas: strength and fragility, inside and outside, positive and negative space, using slips and glazes which reflect or absorb light. As you walk around the work, what was concealed is revealed, and what was implied is expressed. This is done always in a way which transforms mute earthbound clay into eloquent flex and curves and billows. Like a kind of infinite frozen dance, a delicate balance.